Download and print information on this topic and more! 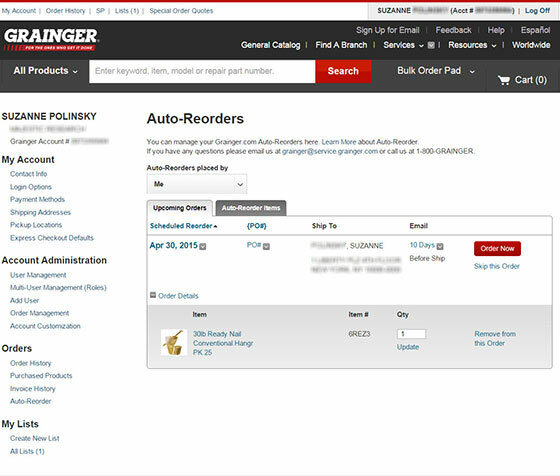 Sign-in to your Grainger.com® account and access “My Account” from the header to manage your Auto-Reorder settings. From here you can view items, set up an Auto-Reorder, edit quantities, update shipping frequency from once a year to as often as once a month. You can even cancel the service with a single click. Managing your auto-reorder settings is easy. View scheduled orders by individual products or by order. Need a reminder each time before your Auto-Reorder is shipped? You can customize how far in advance you prefer to receive your email notifications. Administrators on the account can select to view Auto-Reorders placed by any user on the account and manage the Auto-Reorder setting for all users on the account from the Account Customization section within My Account.